No Screaming While the Bus is in Motion! Nightmare on Elm St. Part 2: Freddy’s Revenge (1985) is a divisive entry in the Nightmare series. Love it or hate it, it is hard to deny that it has one of the best openings of any of the films. We are introduced to Jesse (Mark Patton), looking nervous and a little sweaty as he rides near the back of a school bus that isn’t too crowded but does have its share of rambunctious high school kids. Already Jesse hunched over anxious posture sets a tone of unease. Eventually, Jesse, two girls, and strangely quiet driver are all that is left on board.The bus begins hurtling past stops and races into the desert. 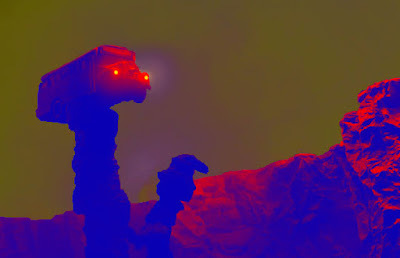 There the ground drops away and the bus teeters on a pillar of rock. There is nowhere to run and the bus driver turned Freddy begins to walk back towards them, scraping his bladed gloves along the seats. Not only does this sequence set the stage for Freddy versus Jesse, but it also capitalizes on an everyday anxiety, and then blows it up to huge proportions. The best dreams in Nightmare films are built from seemingly normal beginnings. Riding the school bus is a stressful enough rite of passage for many kids, so to see it expand out into an actual hellscape where that anxiety is played out over the choice to fall to your death or face Freddy is horrific and dynamic in all the ways that make a viewer invested to see where this is all going.